Okay, so maybe they haven't faded away completely. I saw another knock-off name of a generic brand wanna-be the way and had to chuckle to myself. Then I saw this and well, given all my other Snuggies posts, I figured I might as well throw this one into the pile for comedic relief during a post flashback exploration later. 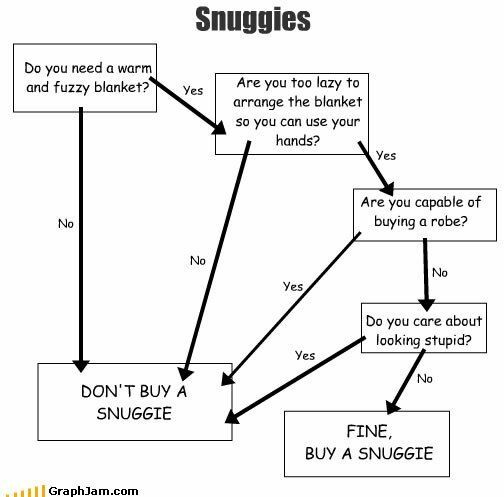 And the verdict is, you probably shouldn't buy a Snuggie unless you really, really, really need a warm fuzzy blanket, are too lazy to use a regular blanket, are incapable of buying a robe, 'and' you enjoy looking stupid. What a winning combination! ROFLOL! Your logic astounds me! Any one who is fearing a lame gift from a mother or grandmother at Christmas needs to forward this post to said mother or grandmother - no guarantee they won't get a lame gift but it decreases their chances of getting stuck with a Snuggie. Does it make me sad that I actually wouldn't mind owning a snuggie. I'm constantly freezing, so anything that keeps me warm would be a valued gift (even if I do look ridiculous in it). I actually like my Snuggie. I may look silly, but I am warm while I'm pecking away at my laptop or crocheting scarves for the homeless.